Oxygen Forensics updates its flagship mobile evidence discovery solution, Oxygen Forensic Suite 2014, adding physical acquisition support for MTK-based Android devices and introducing dual-joint logical acquisition support for all Android devices. Oxygen Forensic Suite 2014 supports more than twenty different acquisition methods for multiple platforms. No single competitor comes close to the number and diversity of acquisition methods supported in Oxygen Forensic Suite. The new release greatly simplifies the acquisition of MTK-based Android devices, allowing investigators making a full physical dump of the device while seamlessly bypassing the lock screen. The new physical acquisition method requires no rooting to get full access to the device data. In addition, Oxygen Forensic Suite 2014 implements a new approach to logical acquisition of Android devices. The new joint extraction method works by combining data acquired via Android backup and with OxyAgent utility, returning the most complete data set possible via logical acquisition. The new joint extraction method automatically complements pieces of information that might be otherwise missing if only one acquisition method was used. The latest release adds physical acquisition for MediaTek-based Android devices. The ability to make a full dump of the device memory is essential for investigators, especially if the device is locked with a passkey. The new physical acquisition method used by Oxygen Forensic Suite 2014 can seamlessly bypass the passkey and requires no device rooting. In addition to physical acquisition, the new release offers an enhanced version of logical data extraction. Available for all Android devices, the new approach combines information acquired via Android backup with data obtained with OxyAgent installed into the device. Combined together, the two data sets complement each other, giving investigators access to the most complete information available via logical acquisition. Oxygen Forensic Suite 2014 helps investigators and forensic specialists access and analyze data from a variety of mobile devices such as cell phones, smartphones, tablet PCs and other communication devices. Currently supporting more than 8,200 different models, Oxygen Forensic Suite 2014 covers the widest range of mobile devices compared to competition, and allows fully automated acquisition and analysis of supported devices. Founded in 2000, Oxygen Forensics is the worldwide leading maker of the advanced forensic data examination tools for smartphones and other mobile devices. The company is dedicated to delivering the most universal forensic solution covering the widest range of mobile devices running Android, iOS, Blackberry, Windows Phone, Symbian and other operating systems. Law enforcement and government agencies, institutions, corporations and private investigators, help desk personnel and thousands of private consumers rely on Oxygen Forensics products to ensure evidence availability in the event of mobile device data analysis and recovery. Oxygen Forensics customers include PricewaterhouseCoopers, Ernst & Young as well as various US and European federal and state agencies such as the IRS, US Army, US Department of Defense (DOD), US Department of Justice, US Department of Homeland Security, US Department of Transportation, US Postal Service, US Supreme Court, European Commission, London Metropolitan Police, French National Police and Gendarmerie and many others. As a result, Oxygen Forensic Suite receives great response at forensic conferences, exhibitions and trainings, and occupies a spot on the top of the list in relevant tests for extracting more data than competitors. 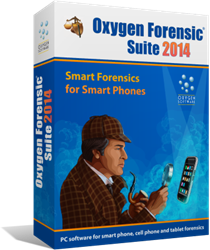 Oxygen Forensic Suite 2014 Adds New Acquisition Methods for Android Devices Oxygen Forensic Suite. Timeline Oxygen Forensic Suite Whitepaper.